The Queen is Colonel in Chief of the Royal 22nd Regiment in Canada and has a brooch version of their cap badge to wear when appropriate. 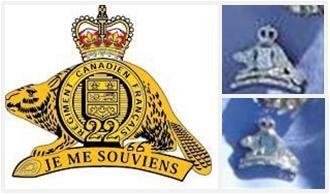 The badge features a beaver on top of a log with the regiment's motto (Je me souviens, or I Remember) and behind their arms, the words Regiment Canadian Français, and the number 22. The badge is topped by a crown. It is made of a light metal such as silver or platinum.